We are fully licensed and insured contractors. Beyond this we hold ourselves and our contractors to the highest standards and we guarantee you will be 100% satisfied. We offer free, no obligation, in home estimates. Your bathroom remodeling project can be completed in 1-3 weeks, but is dependent on the size and scope of the work. We use many types of material to give your bathroom the look you want. Tile is a very common material to use as well as marble for a high end look. Contact us for inquiries on other materials. We offer many options for bathroom amenities: Lighting fixtures, sinks and vanities, tubs and showers. Of home renovation projects the bathroom is regularly chosen as the room to get an update. The only other room that gets more attention for renovation in Cache Valley is kitchen remodeling, Logan UT. It is fairly common to remodel both of these rooms at the same time as it updates two of the most used space in the house and provides a significant raise in the overall value of your home. 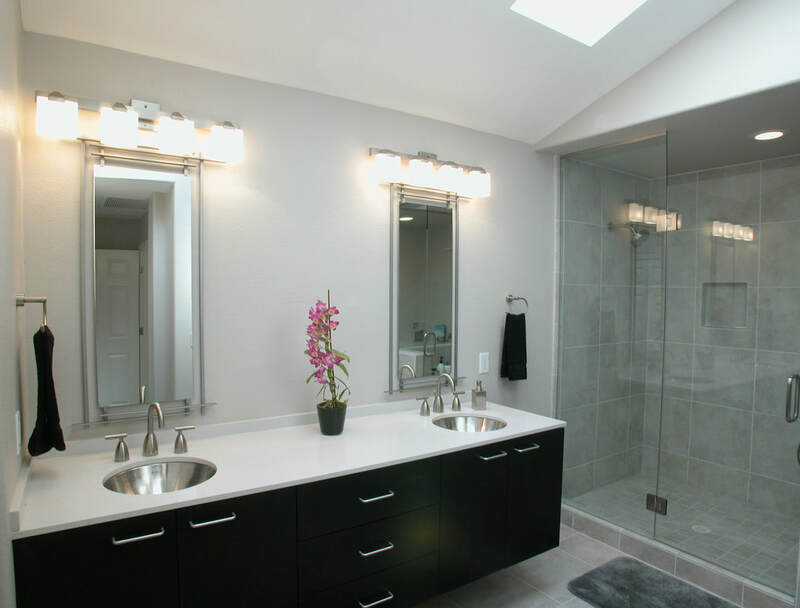 So why should you use Home Remodel Logan for your bathroom renovations? We have the experience and skills to tackle any of your bathroom remodeling projects. We can walk you through the process from start to finish. With over 20 years of experience and relationships with the best suppliers of high quality materials we have the tools necessary to complete your project with the highest level of satisfaction. Our experience also allows us to get your job completed in a quick and efficient manner without cutting corners and sacrificing the quality of the work. We are able to maximize the quality of creating the bathroom of your dreams while also sticking to the budget that you have for your bathroom renovation. We can fully renovate an existing bathroom, add on to your home to create a new bathroom or even extend the room to give you the additional space you need. why remodel your bathroom? One of the main reasons why a bathroom remodel is so common is because of the high use of this one room of the house. The bathroom sees daily use and is typically the room in the home that deteriorates the fastest. Another common reason, that is also related to to the high frequency of use, is that bathrooms are commonly used as a place to bathe and relax after. By having a and having an upgraded, or even luxurious spa-style the bathroom you will be able to find that place of deep relaxation in your home. The last and main reason to remodel is that a quality bathroom will increase the value of your home. It is even known a run down and outdated bathroom may make a home more difficult to sell. When it comes to bathroom remodels we know our stuff. We have been asked to do countless bathroom remodels over the years and are qualified in all aspects of a bathroom remodel. We can replace flooring wether it is vinyl, tile or wood. Remove the subfloor underneath the old flooring when necessary. We do amazing tile work in walls, sinks, and showers. We also use mosaic tile for accents. Customize your vanity. Choose from marble, stone, granite and quartz. We can customize the vanity to fit any space, big or small. Install a new tubs, jacuzzi or put in a new shower stall with a sit-down ledge. install tile insets for storage. Install shower curtains with a curve to add space in the shower. We can help you choose smart LED lighting that is energy efficient and place it in the best spot in the room: outside/inside showers and stalls, over vanities and mirrors, or in recessed areas. Add fixtures: heated towel racks, shelving, tissue holders, towel bars and more. These make a big difference in the functionality of your bathroom. Remodeling your bathroom is not a simple job and presents a big risk for DIYers. A full bathroom remodel involves a lot of work that covers a wide range of necessary skills to complete and because of the nature of a bathroom (think toilet and shower) and all of the potential things that could go wrong (leaky toilet or sink... YUCK) it is far better to have a professional do the work. Home Remodel Logan is available to day for your bathroom remodeling needs and we are ready walk you through every step of the process from design to installation we will guide you through it all. We provide bathroom remodeling services to all of Logan,Providence, North Logan, Smithfield, and all of Cache County and the surrounding counties. the time frame to complete a project like a bathroom remodel may vary but typically we will finish the job in about 1-3 weeks from when we start. So what are you waiting for? Call Home Remodel Logan and we answer any questions you might have, and don't forget we offer our no cost and no obligation quote for all your remodeling needs.